This guide will tell how to resize C drive when Windows Server 2012 PC is showing low disk space warning on the partition. Download IM-Magic Partition Resizer Server to fix low disk space on Windows Server 2012 C drive. It is risk-free and reliable. When you receive low disk space alert message on Windows 2012 C drive, firstly go to check if there is free space on other partitions on the same hard disk. As long as there is free space on any of partitions on the same hard disk, you can run Partition Resizer Server to move the free space to extend C drive easily. Add free space to c drive. "My PC is telling that C drive runs out of disk space when I attempted to install a program. My PC runs under Windows Server 2012 operating system and it asks me to delete some old files to free up disk space on C drive. C drive contains some very important programs, so I cannot delete them. Is there any other way to fix the low disk space problem without deleting any file?" 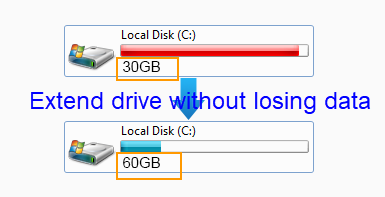 How to Fix C Drive Has Low Disk Space on Server 2012? Windows Server 2012 is the latest operating system of Microsoft, which enables its users to resize partition server 2012 under Disk Management but just not the system volume. If there is free space just next to the system volume, you may use diskpart or Disk Management to see whether extend volume does not grayed out or not, if no, then you may freely extend the c drive to fix the low disk space for free. 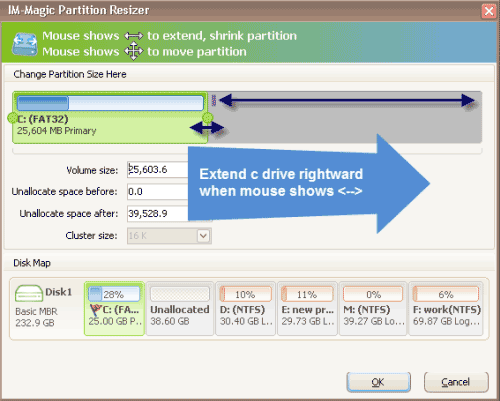 Or you may freely use Partition Resizer Server edition to resize the c drive.